I got me several bottles in my first order but Im not going to list them all, instead I´ll settle with one of the three aromas I tested the first day. On their image you can see Nuts, Bananas and Caramel which I thought sounded really sweet, much more interesting then just banan anyway. 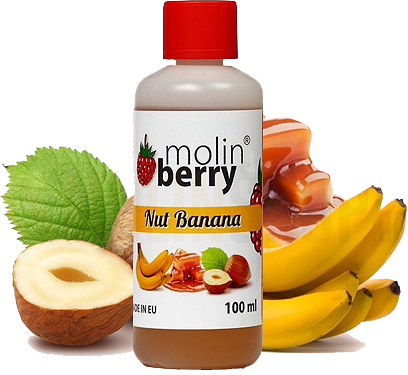 First test, after som research I made a mix of 8% Nut banana aroma, in 8mg 70/30% PG/VG (70% PG). I had it crockpot in my coffeemaker for 3 hours, cool down and after that breeth and steep for another 12 hours. 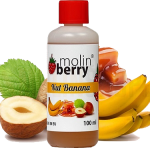 Well it tastes banana alright, you taste the caramel a lot, a really really nice sweet vape if you like bananas and caramel, and every vape I could swear it tasted like something familiar and after a while i finally figured it out. It tasted EXACTLY like the candy everyone ate when I was a little kid, Banana skids! If you ever eaten banana skids, then you know how this vape taste. The flavors came out really nice, amazingly nice and my speed-steeping was good enough, but maybe I could have settled with a 6 or 7% mix and I have really nothing to complain about. It was all that I expected and then some, In fact it got me inspired to use it with some other aromas so just before I started writing this I started a new batch where I added 3% Milkshake and 2% Creamy Vanilla. I´ll let you know how that turns out another day.